Businesses expect their input prices to jump by 4.6% in 2017. “Activity in the region’s service sector held steady”: that’s how the New York Fed today introduced the December results of its Business Leader Survey, which covers the region’s service sector. “Steady” in this case means a negative 0.6 in the diffusion index of Business Activity, where everything below zero indicates that conditions deteriorated over the past month. 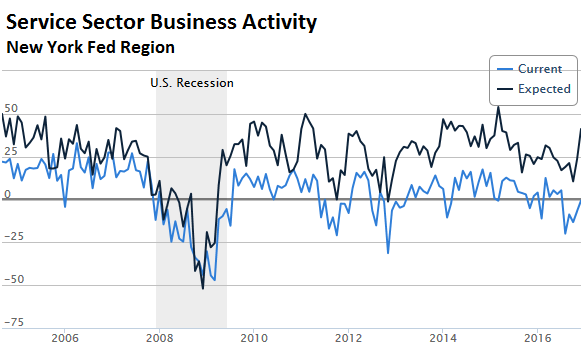 The last time the Business Activity index was positive was in July. It has been negative for much of the time over the past 12 months. In the current survey, 27% of respondents reported that conditions improved over the month, and 27% said conditions worsened. And this is happening in the thriving service sector in the New York Fed’s district (State of New York, the 12 northern counties of New Jersey, Fairfield County in Connecticut, Puerto Rico, and the US Virgin Islands). 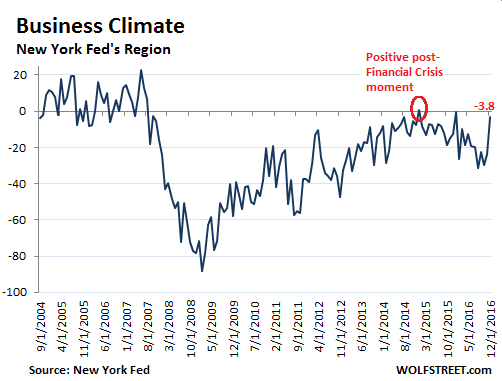 In the chart below, the Current Conditions index (blue line) indicates whether the reality, as businesses are experiencing it, is improving or deteriorating. Now at -0.6. The report on the service sector in the New York Fed’s district was this sort of mixed bag. But what I want to focus on are the inflation measures. People often think that inflation – as in consumer price inflation or wholesale price inflation – is a result of strong demand and a healthy economy, and that there cannot be any inflation when demand is lousy. But that’s not the case. Inflation can increase, and sharply so, for a number of reasons other than demand. Inflation expectations have something to do with it. That’s why they’re tracked in so many ways. A separate report released today by the New York Fed, the Supplemental Survey Report, sheds some additional light on businesses’ inflation expectations for 2017: they’re jumping. Respondents in the service sector reported that their prices paid in 2016 already rose 4.1%, and those in the manufacturing sector reported that their prices paid rose by 4.0%. In December a year ago, they’d reported that prices paid in 2015 had increased 3.5%. And for 2017, they expect prices paid to increase by about 4.6%. Among the major categories, employee benefits were the biggest culprit in 2016 in actual prices paid. In 2017, they’re expected to soar 7.7% for the service sector and 6.5% for the manufacturing sector. Liability insurance, fire insurance, and other types of insurance are next, with an expected increase of 4.2% and 3.4% respectively. But expectations of wage increases “remained fairly subdued,” at 3.5% and 3.8% respectively, followed by outside services, energy, and other commodities. All of these percentage increases are higher than the increases in 2016. That’s the acceleration of inflation for businesses. Prices paid to rise by 8% or more: 11.6% of service firms and 11.7% of manufacturing firms expect prices paid to rise in this range. That’s up from a year ago of 11.0% and 7.6% respectively. Prices paid to rise 2% to 8%: 49.7% of the service sector firms and 49.1% of the manufacturing firms expect prices paid to rise in this range in 2017. That’s up from 47.4% and 42.3% a year ago. Prices paid to increase by less than 2%: 33.9% of service firms and 33.5% of manufacturing firms expect prices paid to increase in this range in 2017. That’s down from 35.6% and 43.4% respectively a year ago. Prices paid to fall: Only a handful of firms expect prices paid to fall. What these business leaders are indicating is that inflation as measured by their input costs has accelerated in 2016 from a year earlier, and is expected to accelerate further in 2017. These input prices for service and manufacturing firms are expected to rise on average by 4.6% in 2017. That’s a lot faster than the official measures for consumer price inflation – CPI and the Fed’s preferred PCE. They’re currently below 2%. These are the types of inflation pressures that are now building up deep in the pipeline, despite lackluster demand. Even Japanese consumers, supposedly suffering from two decades of deflation, are getting whacked. No one escapes. Read… How Inflation Bites Much More than the Official Hoax and 160 Comments. Seems to sound like a lot of hipe if you ask me, whether if any future inflation occurs in the near term. Hipe is driving up oil and industrial metal prices recently as people assume we will buy loads of stuff in 2017, but what if the status quote remains? That any people’s extra savings goes towards paying down debt, or paying health care costs, or higher mortgage bills now that the rates are rising, or just money put into a savings account..
FIRE inflation feeding through to the productive economy. Wage earners are losing ground. For about three decades now, due to “free” trade. Momma always told me, “inflation was like a cup of Ivanka coffee” it goes up and they take it down. Contraction isn’t inflationary last I checked. Amazon is doing their duty helping to eliminate retail jobs, wonder how Treasury tax receipts are doing? World wide dumping of treasuries and QE to infinity/printing dollars full bore. Venezuela in the US here we go. I believe we have been here before. Remember Peter Schiff? -Lexus es300 97 was $36,000- . much better & luxurious car. That’s + 14%/20 yrs . -They overbuild. Flood the market when it’s too late. Beyond peak. a recession or a major slump. when the JPY:USD will be 300 . -Are they going to flood the market ?? I have mentioned the digital camera market before and I think there are similarities. A DSLR camera with capabilities similar to a current $300 entry model might have cost $5000 just 15 years ago, and the current model will have far more features and higher operational speed. So prices have come down a lot, although image quality maybe isn’t in every way as good and prices for good lenses have increased a bit instead of decreased. However … there is now a clear trend that prices of the more higher end DSLR and mirrorless cameras are going UP instead of down (especially in Europe, less so in US because of the surging dollar), because sales numbers and turnover for camera companies have been declining strongly for several years due to smartphones, market saturation in general etc. Camera manufacturers are getting squeezed and without new markets to tap, they can only increase prices and hope the customers accept. And sooner or later, some of the big players may go out of business because raising prices shrinks the market even further. The same might start to happen with cars due to trends like car sharing (instead of owning), autonomous cars and less appeal of cars in general for the average consumer (due to congestion, taxes etc.). This might become evident even faster for ‘quality’ cars using conventional combustion engines. You might get a car that looks better and more luxury for the money from the outside and from the spec sheet, but if the price is lower the real quality under the hood is probably lower as well. If you want real quality (high mechanical quality, durability, reliability etc. ), the only way for prices is up. Michael, could you check the formatting of your commnents. You’re putting line breaks in the middle of the sentence, which puts the rest of the sentence into a new line, which makes it hard to read. If you use a smartphone, it might look ok on your particular device, but it looks like a poem on other devices. Inflation wouldn’t affect the end consumer if business people were to lower their expectations and a life style above their station in life. China could help by reducing its manufacturing coats so that the prices to customers are unchanged. We should pursue deflation ! I’ve personally gone from “upper middle class” to “working poor” during my work career. Even after promotions. Even working a job where there has supposedly been a “shortage of skilled technicians” for 10-15 years. That’s what happens with 5%/every three year “raises” and 2-3% COLAs over 30 years. Your loss of standard of living is more noticeable when you stay off the “housing ladder”/”cash out refi” wagon. It’s simple really. The suit types are incentivized to cut “overhead”, mainly labor costs. Those that don’t get laid off outright get force fed pay and benefit cuts. Don’t like it? You are invited to GTFOOD, and find a new, better paying job in a job market that resembles the Great Depression for most of the Wretched Refuse. The money saved goes into the pockets of the suits and the shareholders. Same with outsourcing. Was Carrier AC going to charge less for their AC systems by relocating to Mexico? Hell no. The suits would be rewarded handsomely for their “tough” decision. Do you should be the suit type or an investor, trader, hedge fund manager etc. Inflation in everything you need resulting in stagnating economy elsewhere and deflation in everything you want. Control healthcare costs and regulate monopolies. I agree, monopolies are a key issue. Monopolies lead to reduced competition. less innovation, and less jobs. This is also a key reason why there is great wealth disparity like in 1929 – only the business owners benefit through cost cutting. The economies of scale don’t provide benefit to the overall world economy when there is rampant joblessness. Forbidding large mergers is one of the most pain-free ways to prevent job losses from continuing. If several huge companies are broken up, we would actually create many high-end jobs. I can accept job losses from innovation. I can take job losses from globalization. What I have a hard time accepting are job losses caused by Fat Cats that want to unfairly reduce competition. In a chess game, you simply can’t buy out your opponent before he makes a good move. Regulators shouldn’t allow this to happen, yet they do – likely because our corrupt campaign finance system. Money buys power, kills fairness and competition. Right. Regulators allow this to happen because they are corrupted by neo-liberal capitalism. Neo-liberals deny and don’t want people to understand that capitalism lacking regulations is fertile ground for monopolies; just like in the wild where the top of the food chain remains unchanged for millions of years. Capitalism money corrupts regulators, the masses no longer trust regulators (i.e. The Government) and therefore demand less government intervention and less regulation and as a result, this creates a breeding ground for monopolies. Because of the circus of Regulatory Capture. Regulators often have worked for those they are regulating and then when they quit regulating the go back to work for the same or get paid as consultants. And the law doesn’t prevent this because the thinking is that ONLY those who have worked in certain type of business can have any idea how to regulate it.. So the foxes guards the hen houses. Hurdle the little guy through regulation that monopoly can avoid by moving off shore. But I suspect that rising healthcare costs and insurance overhead, neither of which “benefit” employees, were the main culprits. What bothers me is that the knee-jerk reaction to such trends is to cut benefits to employees in real terms, rather than focus on the real problems of rent-seeking, monopoly, and regulatory capture. -Few days ago you had a comment that many of readers are using smart phones. – I adjusted to these group of readers. I try to write short sentences, more like punch lines while limiting my email in length and info. -Not a poet. Cannot, even speak or write English well. – I use google to correct 50% of the content. -Hard work, but a great pleasure !! Thanks. The comment software adjusts automatically to screen size, whether smartphone or steam-powered PC. So you don’t have to worry about it. If I were a “malicious seller” I’d say the New York Fed has finally stopped cooking the books. But since I am above such behavior, they must have finally adjusted their emtrics to the situation on the ground: those are numbers we have long seen. First hand example: between 2005 and 2016 Honda has hiked the price of their industrial/gardening/agricultural engines and spare parts every January except for 2009. The price increase has always been between 3.5 and 5%. These engines are in my opinion a better inflationary indicator than cars and electronics, as improvements have been minimal over this time frame and mostly tied to emission regulation and attempts to reduce manufacturing costs. Apart from a few karting enthusiasts and DIY mechanics, the general public is highly unlikely to buy these engines, so the cost increase is mostly born by equipment manufacturers. That’s part of the reason why these days the quality gap between “homeowner” and “professional” grade equipment is widening: the big manufacturers such as Husqvarna AB know extremely well their retail customers’ wages have not kept up with real world inflation in a long time so they cut everything they can. This past Summer I saw the new lawnmowers Husqvarna AB is selling on the European market. At the moment they are assembled in Italy from Chinese components but that may change in the future as the Swedish group recently opened a new assembly plant in Spain and another in Poland. To be honest I would be embarrassed to sell such a product, but I also understand the pressures Husqvarna AB is under. Nobody is immune these days. While 30 years ago many tools were designed to last a lifetime, now many of them are more of the ‘disposable’ philosophy … It won’t last but the price is so low that most consumers will not care and simply buy a new tool when they need it for a job. Probably the average consumer is also using far less tools nowadays compared to one generation ago. And it’s not just tools, it’s almost everything. Someone else mentioned here how the quality of T-shirts went down the drain, probably even faster than the prices declined. I use power tools a lot, almost every day. The cheap Chinese stuff is so much less expensive than the more expensive brands (which may be made in China as well) , that I don’t worry about damage, theft, loss and product life anymore. I’ve had more tools lost and stolen than I ever had just wear out or break from normal use. I’ve also got friends who’ve bought the expensive brands and had plenty of problems with quality and product life. Most are now converts to cheaper tools. yes, I can imagine; I think it is just a bit sad how these things have changed, certainly not good for the environment. Yes! Quality has absolutely gone into the toilet. I bought a heavy duty shop vice recently from a well known company that sells Chinese goods. Won’t say the name but it rhymes with ‘Barbour weight’ I bought the more expensive model with the swiveling head ant wasn’t exactly ‘cheap’ ($60 on sale) and the machining on it looked pretty good (the usual tell for bottom or the barrel chi-crap) but after about a month of use the vice head broke off! Yes, -actually fractured and broke off. This was about a 2.5″ thick cast iron cylinder. I was shocked (and pissed) at how poor the metal actually was. Pissed enough to actually hual the thing back to HF and they did replace it outright but I consider it a lesson learned. I am a tradesman (carpenter) and ex shop teacher. A decent vise is at least $250. I doubt they are even available, anymore. On my important main tools I buy 1st class. Dewalt compound, General table saw, stuff like that. Canadian Tire actually offers a very good Mastercraft plunge router, which a rule of thumb is $100 per hp for a decent model (Hitachi, etc). For welding I buy the cheapest 4 1/2 inch grinders possible and buy them in bulk when they are under $20 as loss-leaders. I have them set up with a different application in each one so I do not have to take time and change from grinder disk to wire wheel, etc. They last about a year before the bearings go. Right now we are using a Honda lawn mower that is probably 35 years old. It has been through two families. We will replace it this year with another one which will undoubtably cost 3X what a Briggs and Stratton piece of Chinese crap costs. My kids will get it one day. Regarding bench vices: I take FZA doesn’t sell their products outside of Europe. They are still exactly the same as they were forty years ago and they are still made in Italy in their old factory. I had a look at their catalog recently and they still list exactly the same cast iron ones I have, which are 28 years old, down to the markings. Good article. Business expenses are rising sharply but whether they can pass them on to their customers is another matter. It may be that profits will be under even more pressure. Profit margins will mean-revert. The Business Climate index looked good before the recession and never came close to recovering to those previous numbers. Is that a sign of how poor this country is getting? “But that’s not the case. Inflation can increase, and sharply so, for a number of reasons other than demand. Inflation expectations have something to do with it.” But not much- you don’t run a fever just because you think you might get the flu. There is a close and inexorable correlation between inflation and the growth of the national debt, though recent increases in domestic oil production through fracking have helped keep the PPI lower than it otherwise would have been. If you want tools that will last, you have to pay top dollar and do your homework. Many are German made. For things like a vise; literally, I would be looking on Craigslist or EBAY for an old American made beauty…..well it wouldn’t be pretty to look at after all these years, but I’ll bet you a bottom dollar it works great still. Harbor Freight is ok for certain things. I buy expendables there like nitrile gloves, chip brushes, cheap abrasives, etc. But you get what you pay for in general. legislators are not trying to reduce the cost of doing business. these costs can only be absorbed by large companies crowding out the little guy . ” level the playing field ” . As I’ve said before, and I don’t care what people with no experience in the sector says, Big Business loves tight regulation. It’s a small price to pay to eliminate competition or to make it less efficient. Big Business can afford to deal with legally mandated higher costs through a variety of means: outsourcing, moving to States which give them tax breaks offsetting insurance costs, hiring interinal workers… and they can do so while maintaining their profit margins. Their smaller competitors either cannot (and so have to pass higher costs to their customers) or can do so only by reducing their margins from next to nothing to almost nothing. Of course Big Business is not that smart: see their cavorting to “keep the Chinese out” of certain markets only for their CEO’s to sell off the family jewels once Chinese oligarchs and SOEs came waving not so big wands of cash. agree, I see the same here in Europe. Getting CE approval for a new consumer product or e.g. our version of FDA approval for some diagnostic test costs loads of money for lawyers and government agencies that small companies can hardly afford. It doesn’t have any real value because it is just paperwork and doesn’t add any actual certification. If it doesn’t eliminate the competition entirely it at least makes new products from small competitors way more expensive. It stifles innovation as well, so big companies have more time to milk their aging products.